Martial Views: MMA: Sport or Spectacle? A co-worker asked me recently if I thought mixed martial arts was a "sport." Sport as a word has a wide range. Badminton is a sport. So are billiards. I think what my friend was getting at, like many people, is twofold. First, it's the idea that MMA contests are seemingly devoid of any rules. Secondly, rules notwithstanding, anything that involves gore and violence of this kind shouldn't even be granted viewership, let alone be classified as sport. MMA is still banned in my home state of New York, much to the delight, I'm sure, of promoters in neighboring New Jersey where it is sanctioned and regulated. Mixed Martial Arts competitions have changed dramatically since the first Ultimate Fighting Championship in 1993. The overall injury rate in MMA competitions is now similar to other combat sports, including boxing. Knockout rates are lower in MMA competitions than in boxing. This suggests a reduced risk of TBI [traumatic brain injury] in MMA competitions when compared to other events involving striking. Years later, McCain did recant somewhat on his earlier position by stating, "They have cleaned up the sport to the point, at least in my view, where it is not human cockfighting any more. I think they've made significant progress. They haven't made me a fan, but they have made progress." Granted, I'm not a fan of MMA, either. At this point, "mixed martial arts" strikes me as a misnomer. If I was born a generation later my take on it would be different, I'm sure. I don't think MMA should be banned, though. What do you think? I enjoy watching a good MMA match. I do not enjoy watching unskilled fighters slug it out, which is something a lot of people like to watch. When I watch MMA fights I am looking at technique, timing and strategy and enjoying it for the art of it--seeing two people who have trained very hard compete to test themselves and what they have learned, while coming out friends at the end of it. That's what I like to see. I always thought that martial arts was to eliminate threat as quickly as you can. So you learn some nasty stuff. I never really figured out how you turn that in to sports. It can only result to a match of who can hurt the other more without the eliminating aspect. So now it is not martial arts anymore, nor is it sports (when consindering sports is a competition to measure skill in a non harmfull way)In the basics it now seems no different than een chessmatch. I would not describe myself as a fan. However, I will watch the occasional match. I train at a place that has an MMA track to I'm around a lot of local wannabes. It's a martial sport that is not one dimensional like boxing. RE: Banning. I'm not for banning it. I think the politicians are picking on an easy target. Want to really do some good? Take on texting while driving or the proliferation of firearms! Banning MMA is silly; extra so in New York, which allows kickboxing, boxing, and even San Da. MMA has as much of a legitimate claim to being a sport as any of those competitive forms do. Gore and violence? Please. I've seen worse on broadcast TV. Hell, I've seen worse on Law and Order occasionally. The term Mixed Martial Arts is arguably inaccurate. Realistically, MMA has evolved to the point where it is its own art, which suggest that it should really be called something else. On the other hand, many who train it are training in multiple arts (mostly Boxing, Muay Thai, Wrestling and BJJ, but others are represented as well), and then drawing upon each of those to create a total fighting strategy. On that is made of "mixed" martial arts. Arguing about the naming is somewhat pointless at this juncture; the term MMA is here to stay. I think NY bans it due to lobbying from the boxing promoters. It is funny because it used to be Mixed Martial Arts, but now it seems to be a BJJ/kick boxing hybrid. The rules pushed it here. Funny, as both BJJ and kickboxing are combat sports as well. Banning? Not, if competitors what to beat one another brains out it is there business. Those who enjoy brutality in any form for a spectator perspective also is there business. Those who enjoy making a lot of money off male testosterone also is there business. Me, I watched it once and came to the conclusion it is NOT a martial art either singularly or mixed. Just my opinion; my viewpoint. As another long time martial artist who also started a competition career in karate tournaments from 1985 to only my final retirement a few years ago, I think MMA was interesting in it's development. In a way, it's what Bruce Lee had started with his Jeet Kune Do. However, for me, I find that despite 'effectiveness' of techniques, as a spectator, I get terribly bored once MMA fighters hit the ground. So for that reason, I never became a fan. I don't think it should be banned but it's just not my cup of tea. I also thing that the MMA scene at times lacks the respect level that we still find in traditional or even 'freestyle' martial arts. Those who enjoy making a lot of money off male testosterone also is their business. 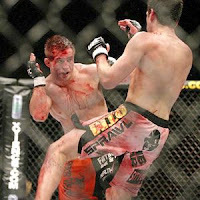 ...despite 'effectiveness' of techniques, as a spectator, I get terribly bored once MMA fighters hit the ground. I hear that. I respect the ground stuff, but I really enjoy a good standup fight much more. I don't follow MMA too much, but it does seem that there's more of a tendency for competitors to stay on their feet these days then when this whole thing started back in the 90s. Very good article. At the beginning I really disliked MMA fights because I saw only way of denigrate the other martial arts that were not the jiu-jitsu. But nowadays I think this is different and the competition developed it a lot. Anyway, I've been accompanied since Royce Gracie's fights in the beginning of UFC championship. It's amazing how the Gracies changed martial arts. In a way as much or maybe even more than Bruce Lee, Chuck Norris, et al. Great perspective. I started a comment, but after the 3rd paragraph, decided to just post on it as a reply. Thanks for throwing me that link -- your post was very insightful. I tried to comment on your site but I seem to be having problems. Anyway, you brought up a couple of good points I left out. One is the fact that MMA players are bona fide athletes. Some of their training regimens are unbelievable. The other thing is the apparent lack of philosophy or "life skills" as you called it. It's the -do aspect of traditional martial arts that give them special meaning beyond sport or self-defense. I agree with Jake's points, and would add that I've seen some pretty nasty (scary) KOs in sport TKD. Should that be banned? If attempt to ban any dangerous activity (an impossibility), does that not criminalize driving period, much less while texting? And Bud's point of banning due to boxing sounds like it's possible. But I don't know how many competitions are still held in NY, since I don't really watch boxing anymore. I watch something else which should be banned: American Football! As to Charles' opinion on whether it's a martial art, it depends on one's definition, but I'd go as far as combative sport. Final point (re: Clint Cora's comment) is that I stopped entering my school into tournaments for precisely the same reason - lack of respect, decorum, and even fairness. I think those things are inherent in both competition itself, and the American psyche. Hence, I held my own tournaments, or only attended those run by respected instructors, and would vet the judging to ensure fairness. It worked.